So, what were you doing on the morning of Sunday 9 August? At 8.00 am five of the AMRG were on their way to Swanage on the first days outing of the Group. Arriving at Norden Park and Ride at just after ten, we met Diane on site, (she had camped over night in the field opposite). 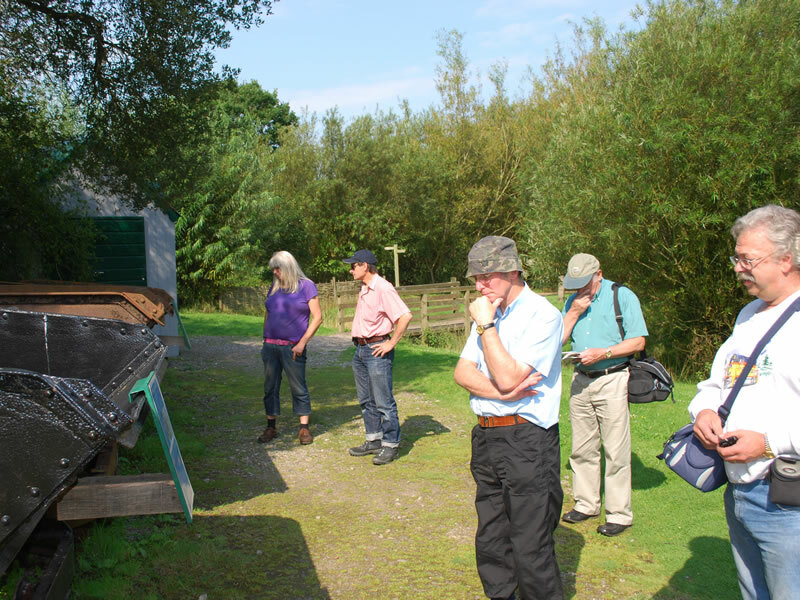 The group were met by volunteer John Rowley who proceeded to outline the history of ball clay mining in the area. John explained the importance of Josiah Wedgewood, Thomas Hyde and Oliver Lodge to the development of the area. Wedgewood indentified the significance of ball clay in the firing of his pottery. The clay enabled the pieces to become finer and less likely to be damaged in firing, both attributes enabling the quality of the pottery and hence the price to increase. The Purbeck area was identified as a significance source of ball clay and contracts were signed with Thomas Lodge to deliver the clay. To facilitate the moving of this bulky load, tram ways were developed, first drawn by horses and subsequently by steam. So the numerous lines began in the area. Oliver Lodge arrived on the scene much later in the 1860s, when he entered into his father’s business of selling ball clay. But his intellectual abilities soon saw him move away from this into the field of academia, where he invented, amongst other things, the spark plug and became the first person to send a wireless message, (ahead of Marconi). The tour around the site enabled us to see the restoration of the buildings and track way and also to see the plans of the Museum Group. The Groups aspirations include developing the site to demonstrate the working of a ball clay adit mine. Denis was suggested as potentially a key part of their developmental plan as an electrical, although he ‘politely’ refused our recommendation. The final part was walking through undergrowth to view the site of the Eldon sidings, were the ball clay was transhipped to the main line. Whilst there we sampled the delights of Freemans Apples. 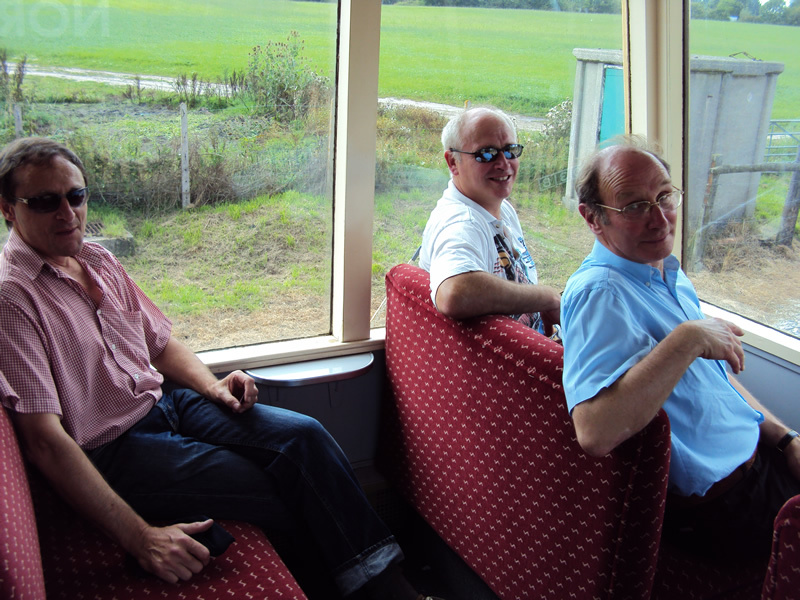 After the tour we had a quick snack in the buffet at Norden and caught the 1.10 to Swanage. 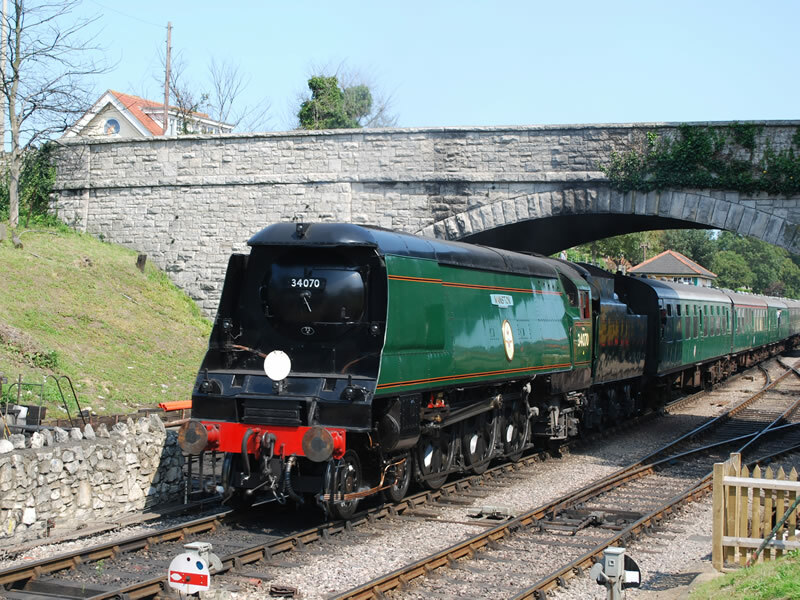 We sat in the newly restored Devon Belle Observation car at the back of the train so arrived in Swanage in style. We then watched the Standard 4 tank take water via a dilapidated spout! This was obviously very interesting yes? Well not to Denis, he was off scuttling off down the platform to a blue and yellow object, Spitfire, 33035, a Class33 diesel!! ‘That has made my day’ Denis was heard to say. Anyway after this ground breaking statement we went day to the beach for our ice cream and paddle, (except guess who?). A walk along the sea front was followed by a return to the station to be taken by Bullied Light Pacific, unrebuilt 34070 Manston. Supper was taken on the way home at The World’s End Public House and then back via a very slow M3. Our first Group outing was, by unanimous verdict a success. John Coates, Diane Kivi, Richard Pretious, Steve Cook, Graham Smith and Denis Stevens. 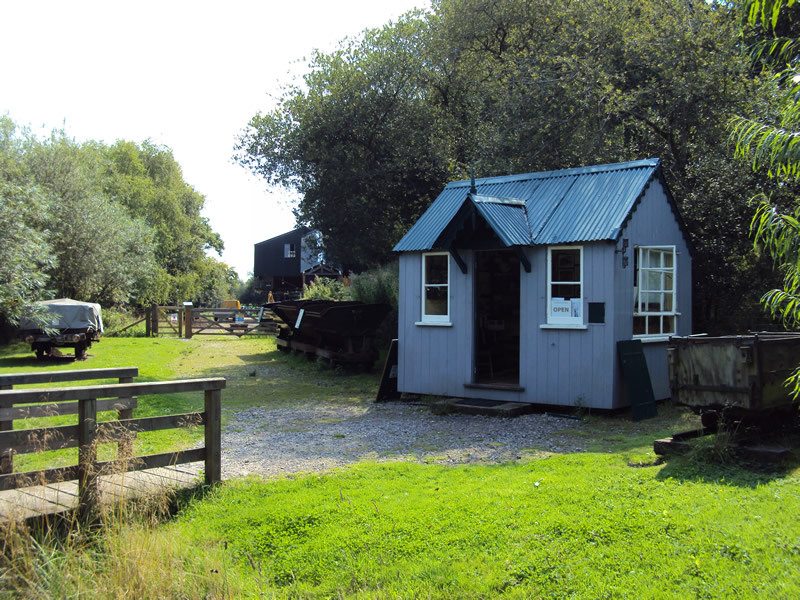 The Foremans office at the Purbeck Mineral & Mining Museum. 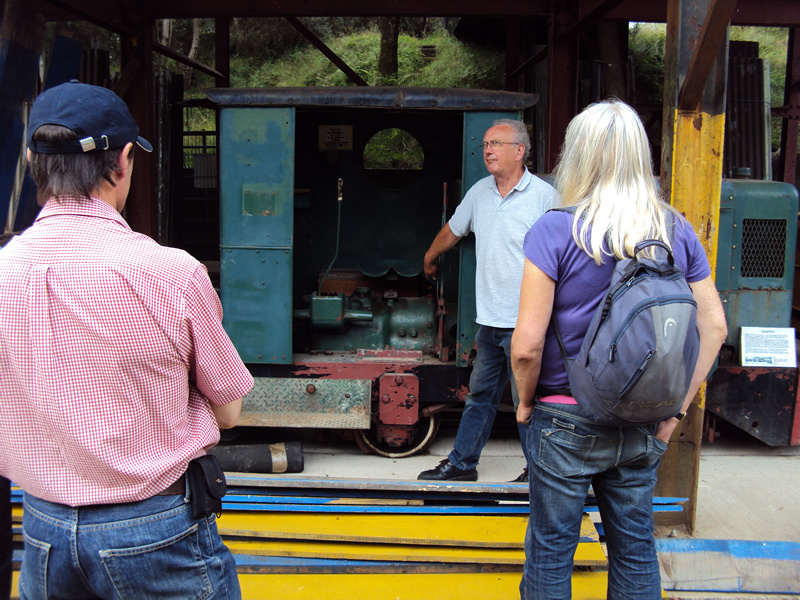 Guide John Rowley shows one of the mining locomotives. The members admire some original ore cars. 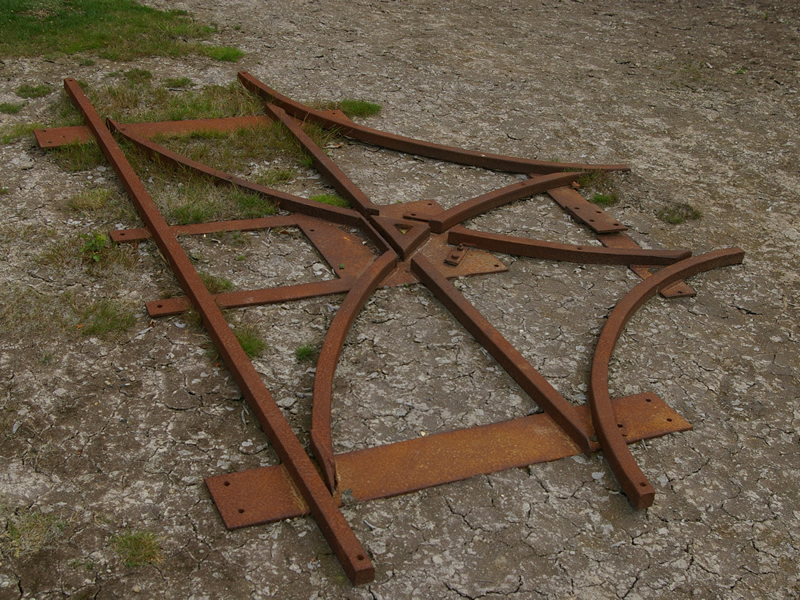 The remains of pointwork at the museum. 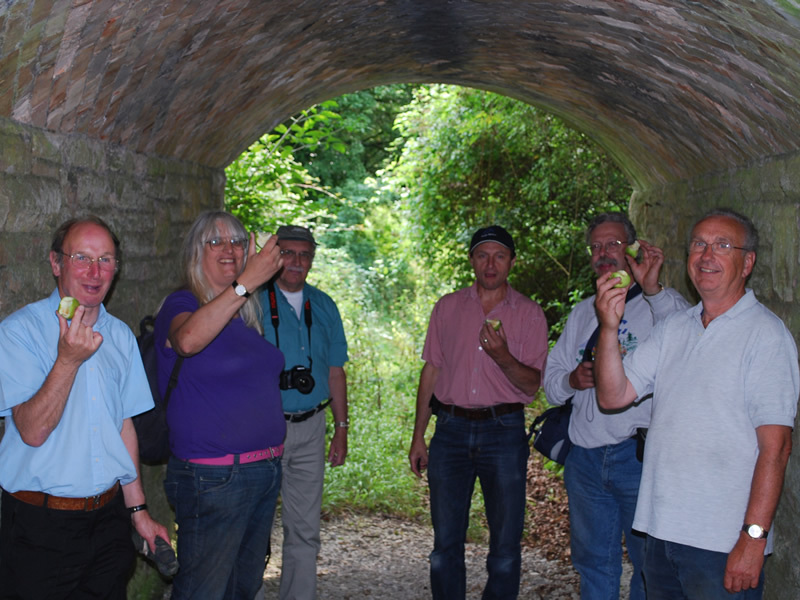 Members and guide enjoy Freemans Apples. 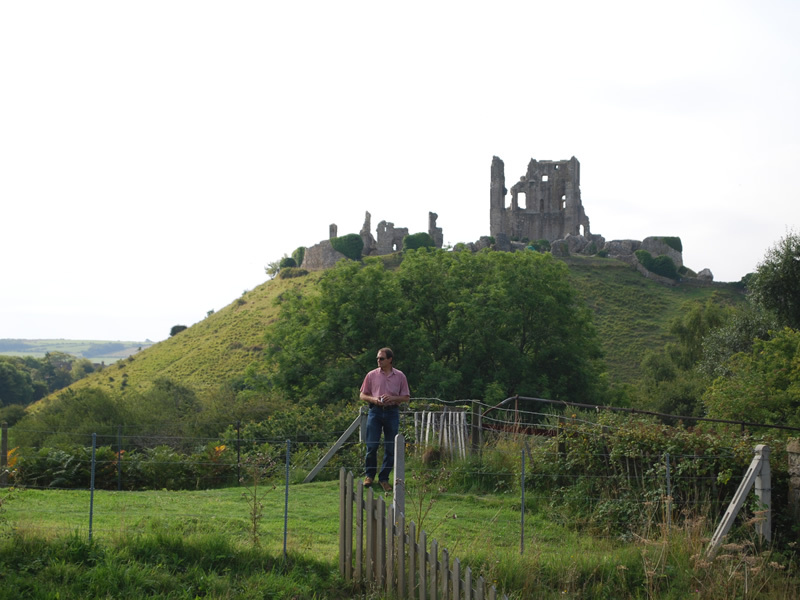 Steve Cook, and Corfe Castle. The Bullied Light Pacific, unrebuilt 34070 Manston. 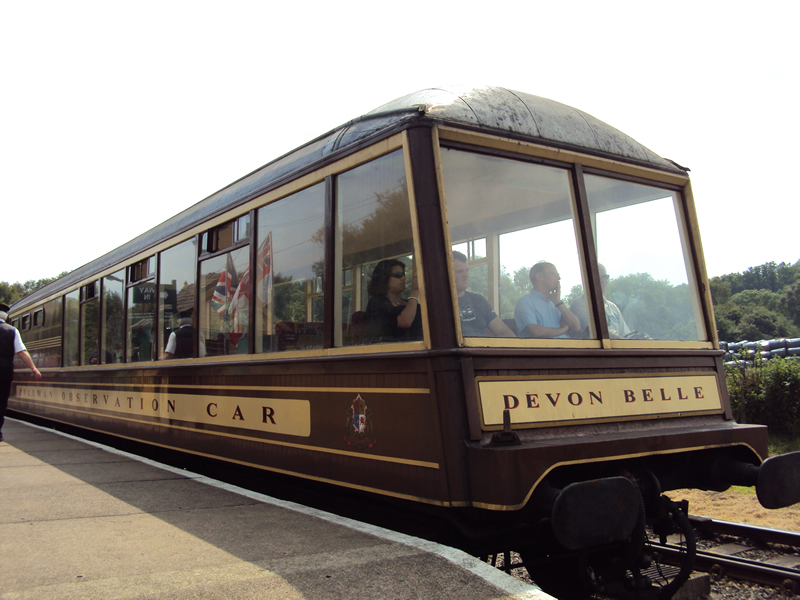 The newly restored Devon Belle Observation Car. 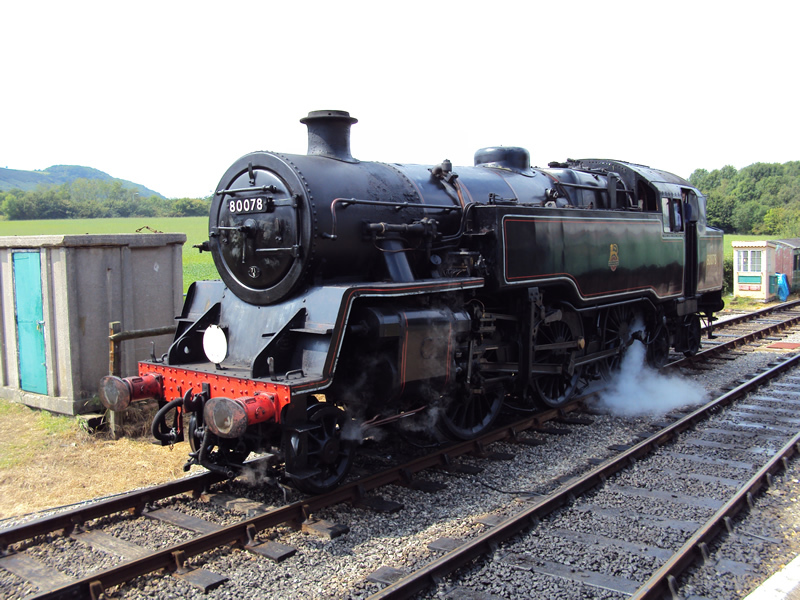 Loco 80078 in BR livery. 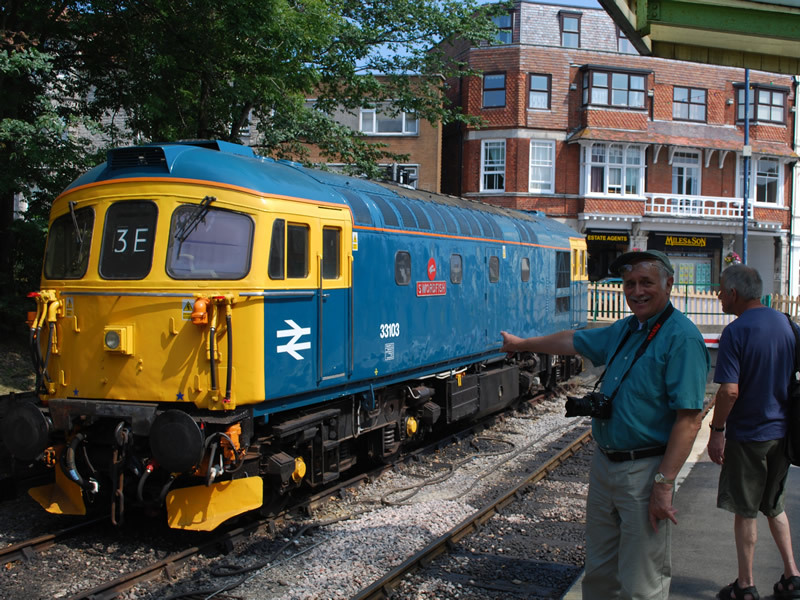 Denis Stevens spots Diesel loco ‘Swordfish’.